Now available for pre-order at the Square Enix e-Store. 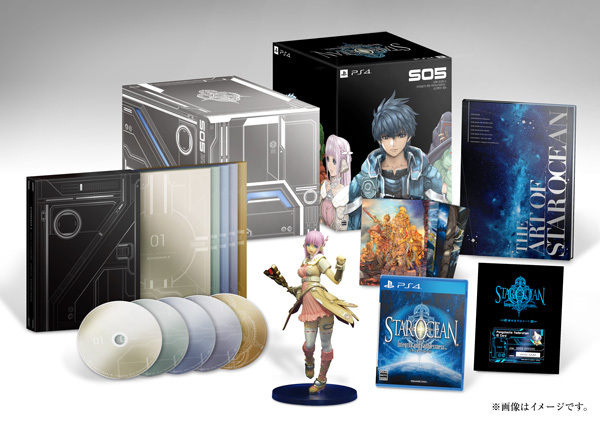 Square Enix announced an “Ultimate Box” version of Star Ocean: Integrity and Faithlessness for Japan during its Star Ocean 5 stage event at the Tokyo Game Show. Miki Special Figure – A 210mm tall figure of Miki, the hero Fidel’s childhood friend. The Art of Star Ocean art book – 80 pages of artwork, illustrations, and CG. Special Soundtrack – Five-disc soundtrack set in special binding. Special Postcards – Eight postcards featuring Star Ocean 5 illustrations and CG. Pangalactic Federation ID Card – A plastic license with a unique serial number that proves you’re a member of the Pangalactic Federation. Original DLC Download Code – Downloadable content to change the background music to that of other games in the series. Pre orders are currently open at the Square Enix e-Store. Star Ocean: Integrity and Faithlessness will launch for PlayStation 4 and PlayStation 3 in Japan on February 25, and for PlayStation 4 in North America and Europe in 2016. Catch the Tokyo Game Show trailer here and new gameplay footage here.